Has your wired or wireless network printer gone on vacation refusing to communicate with your PC. If so we have your solution. 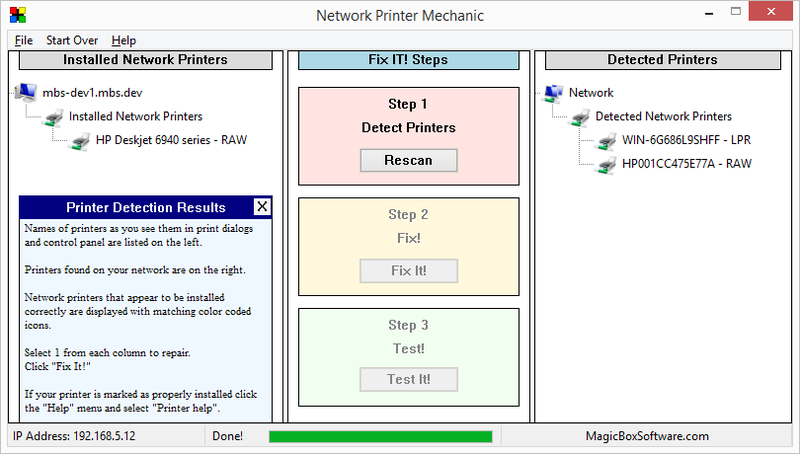 Magic Box Software is proud to announce our latest “get you out of a jam” printer utility, the Network Printer Mechanic. Power outages, moving or even a vacation of your own can land your network printer estranged from your PC unable to print anything. There are manual steps to fix this, but they are time consuming steps. NPM is a much simpler and much faster solution and, at just $4.99 it makes no sense to spend an hour jumping through hoops just to get your printer working. Network Printer Mechanic restores lost connections and promotes harmony among your devices. Of course you can always manually reinstall the printer. That sounds like fun when you need to print, yes? With NPM you can literally be back up and running in the next 2 minutes. Network Printer Mechanic is based on years of experience programming solutions to get stubborn printers up and running. NPM also features core functionality from our flagship Print Queue Cleaner which has helped hundreds of thousands of users out of printer nightmares. Restores lost network printer connections. Simple 3 step user interface. Supports RAW and LPR/LPT printers (most networked printers). Printer tests including direct communication print tests in case something is REALLY wrong. Help links for more complex problems. Includes Print Queue Cleaner functionality for general health maintenance. 3 progressive levels of network scan to find even slow printers on bad networks. Includes the MBX Never Fail Guarantee (Details). Network Printer Mechanic Personal license allows unlimited use on your own computers. Network Printer Mechanic Pro license allows unlimited use by a single user.